Pat Metheney has all the luck. Super chops, tons of awards, signature guitars bearing his name, and and now he has yet another Ibanez signature model guitar. Who wouldn't wanna be this guy? 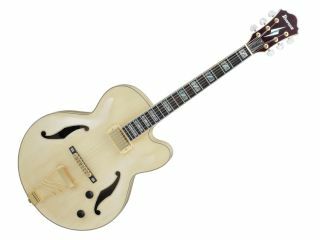 With recent wins by the modern jazz icon in both the Downbeat and Jazz Times readers' polls, Pat Metheny's new Ibanez signature model couldn't debut at a better time. The new PM35NT has the all the appointments, construction, and tone needed to satisfy to discerning jazz guitar adherents - but at a surprisingly inexpensive price relative to most jazz boxes. At just $1066.65 US list, the PM35's price is significantly less than Pat's PM100 and PM120 Prestige professional models. The PM35 features a super-stable 5pc neck of maple and bubinga, a full-hollow maple body, bound rosewood fingerboard, 22 medium frets, and the Ibanez Super 58 pickup, a humbucker renowned for its sweet and warm tones. The PM35NT will be available in May. Be on the lookout for MusicRadar's review at that time.